For more than 30 years, helping those who have been injured. The Law Firm of David C. Chavez, LLC, in Los Lunas, is dedicated to helping those who have suffered a tragic injury in the Albuquerque, Santa Fe, and Los Lunas areas and throughout New Mexico. Attorney David C. Chavez is not afraid to take on multibillion-dollar corporations and huge insurance companies after a wrongful death or tragic injury. Our firm takes on multi-billion dollar companies - with proven results. 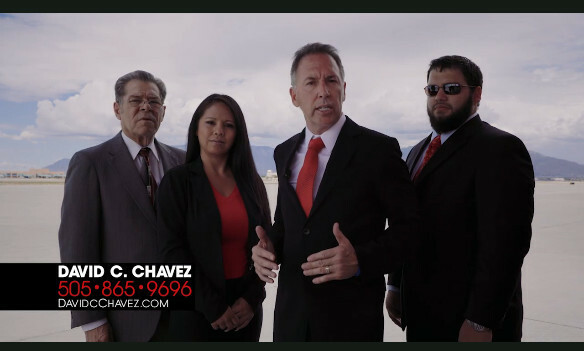 The Law Firm of David C. Chavez, LLC, has experienced trial lawyers. We try cases to verdict and are known throughout New Mexico for getting results for their clients. We have tried and resolved cases resulting in recovering millions of dollars on behalf of our injured clients and their families for over 30 years. In addition to their work in the courtroom, David C. Chavez is frequently on television speaking about issues that impact their clients every day, including appearances on CNN and local channels 7 ABC, 13 CBS, 2 FOX and 4 NBC. "We are A New Mexico Law Firm, We are From New Mexico, We know New Mexico Jurors"
"We Have A Proven record of success in New Mexico"
We Have Recovered Millions for Innocent victims of negligence through no fault of their own caused by the fault of others. We will fight for you to protect your legal rights. We will protect your family and your future. We will fight for you to be fully compensated for your injuries and damages. We are open and available to take your calls 7 days a week to ensure you receive the maximum recovery you need and deserve.